Entrusted with the task of spotting any potential terrorists and chemical specialists who try to get a visa, Kate Abbott, the genius newly-recruited security officer at the U.S. Embassy in London, senses there's something off with the Romanian doctor, Emil Balan; however, her concerns are dismissed by her boss. But, then, after a devastating bombing attack in the heart of the city, Kate will surprisingly find herself in the spotlight and on the wrong side of the law, while at the same time, targeted by the international assassin known only as the Watchmaker. Can Kate unearth the conspiracy and make it in one piece before a new act of terrorism strikes the metropolis? A State Department employee newly posted to the American embassy in London is charged with stopping terrorists from getting into the U.S. That puts her right in the line of fire and she is targeted for death and framed for crimes. Discredited, she is forced to go on the run while she tries to clear her name and stop a large-scale terrorist attack set for New Year's Eve in Times Square. This is the second time in only a few months that Pierce Brosnan has impressed me with his more indie side. I thought November Man was very good and now this isn't far off. It isn't a complex thriller really and some might even call it predictable but it has plenty of action, a good story and decent casting. Its a cat and mouse game with two first rate action actors and the two of them alone are enough to keep things rolling. The film does suffer from a lack of care behind the scenes. I think it suffers from poor editing and poor marketing being I had never heard of this film at all until it had been released on DVD. Or perhaps it was over-edited but either way it feels unpolished in certain respects like maybe the pacing is a little off. We have some great chase scenes but just when the action is really taking off and you're getting into it, it complicates itself with the side plot or other details that aren't necessary. A professional review I read said that its a cheap thriller that thinks its deep and while I think that is a little harsh because I did enjoy it, it does hit the nail on the head. Survivor tries too hard to be complex and brilliant when it should be a shoot-em-up action flick. Pierce Brosnan has definitely been hit and miss since his James Bond days but I still really like the guy. His brooding and mysterious "watchmaker" could have used a lot more depth in the film but he still plays a stone cold killer very well and believable. I can't say he has a lot of charisma in the film but then his character isn't exactly meant to have a whole lot of personality. Milla Jovovich shows a softer side than her usual action roles. She's still tough and smart but when the pressure is on, she shows a more deer-in-the-headlights look to her which is new. Her and Brosnan are good opposite each other and with better direction could have been great. Jovovich plays her role well enough but its not her best. I have always really liked Dylan McDermott and he tends to be the character actor rather than the lead and he is in this as well but I still felt he was underused. I was expecting something more to happen with his character but nothing ever really does. Still he plays his role decently. The film lacks a definitive villain outside of Brosnan but Robert Forster and Emil Balan play good but small roles. 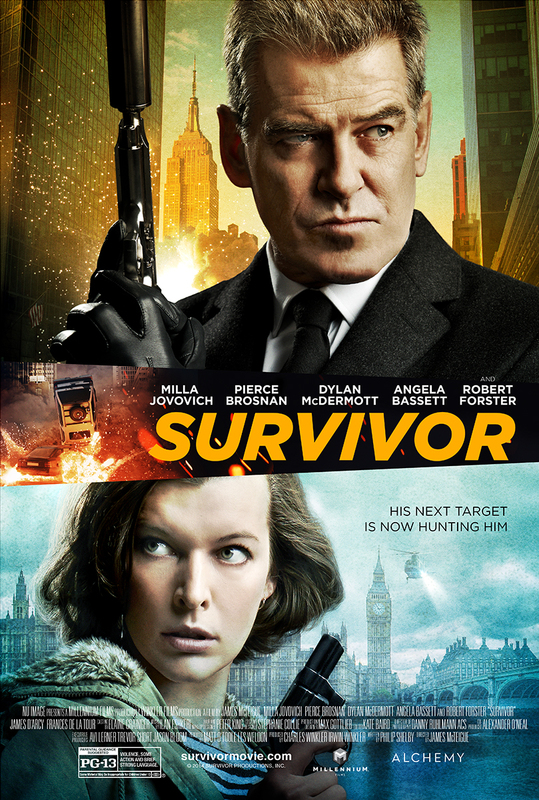 James McTeigue started his directing career on a huge high note when he directed the very smart V For Vendetta and he's worked second string on a lot of projects but Survivor doesn't seem to be a film that he's put a whole lot of heart into. Usually action films (especially spy movies) that take place in Europe all the way to Times Square would be visually stunning with all kinds of stunts and cinematography but this one just sort of plays it safe. It kind of reminds me of a better than average "Made For TV" movie with two decent stars in it. Its still entertaining and I didn't mind watching it but it wouldn't be anything I would add to my collection, watch again or even remember a lot about. If you're a big fan of either Brosnan or Jovovich then check it out because you'll enjoy it but keep those expectations low because this is a definite mid-level entry in their film careers. 7/10 I was expecting too low from this movie because it's ratings and reviews weren't colorful. But I developed a different perception after watching the movie. It's worth the time at-least. I dislike how countries like Afghanistan, Iraq, Pakistan and other Islamic countries are portrayed in cinemas. Can't Americans, Europeans Mongols or Aryans be terrorist? Big head movie makers- knowingly- unknowingly- around the globe are promoting that Islam oriented citizens are dangerous. I don't understand, are we trying to shape a culture here? This is not just about this movie, instead, I hate it every time when one offends or accuses the other no matter in what direction it flows.